Chapter from the book: Tanimoto M. & Wong R. 2019. 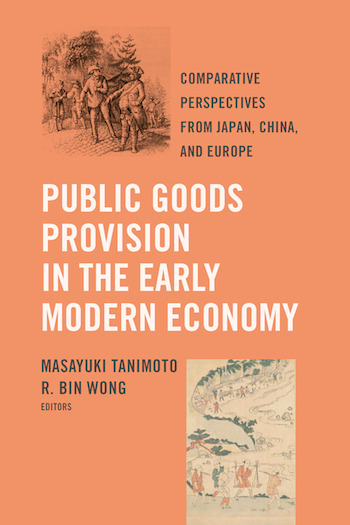 Public Goods Provision in the Early Modern Economy: Comparative Perspectives from Japan, China, and Europe. This concluding chapter, by R. Bin Wong, develops a perspective on the development of modern public finance and public goods examined in this book that is different from the “fiscal state” model drawn from European experiences. It further notes that the relationship between the economy and environment during the modern industrial era included environmental exploitation with little sense of constraint. Public goods were largely limited to those provided by the government. In the early modern and contemporary eras, the concerns regarding the economy and the environment, including the subject areas of this volume, demonstrate the relevance of the early modern era to today’s challenges. This is an Open Access chapter distributed under the terms of the Creative Commons Attribution 4.0 license (unless stated otherwise), which permits unrestricted use, distribution and reproduction in any medium, provided the original work is properly cited. Copyright is retained by the author(s).